1962 Ideal Tammy doll 12"
The Ideal Tammy doll was popular in her day (1962-1966) and is still sought by vintage doll collectors today. Tammy was competition for the Mattel Barbie doll and has a more wholesome appeal or is less curveous if you will. Tammy, like Barbie, had a extensive wardrobe, doll family members (with their own clothing lines), friends of the family dolls, furniture, cars, vinyl cases, homes, accessories and much more. Shown at left; 1962 Ideal Tammy doll & box cover graphics. 1962 Ideal Tammy Doll, 12" tall, there were four different body versions over the years, shown on right is the earliest with straight legs, bubble cut like hair with bangs, that came in several different colors, side glancing painted eyes, red lips, she wore a blue short jumpsuit trimmed with white at neck, bottom of short sleeves and around the waist. Marked on head: © Ideal Toy Corp. BS-12 1, on back: © Ideal Toy Corp. BS-12 2, 3 or 4. Additional Tammy dolls, clothes and accessories were available, Tammy and family dolls were available in many countries around the world. 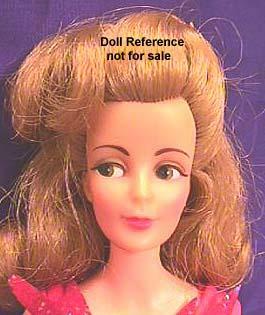 There were Tammy clone dolls too; Canadian Tammy has Reliable marked on her back, Allied Grand's Lorna doll is marked AE plus a number, Fab-lu's Randy doll and Pedigree's Sindy are also Tammy clone dolls. Tammy's slogan was, "The doll you love to dress", this is the earliest box cover graphics. 1964 Ideal Pos'n Tammy doll, 12" tall, now with bendable, posable legs, hair is fuller and has a braided bun, rest about the same as last year, we think the markings were the same too, but unsure. 1964 Pos'n Tammy doll, 12"
1965 Ideal Pos'n Tammy doll, 12" tall, now has a short rooted pageboy hairstyle, slightly slimmer, smaller body than earlier dolls, red lips, side glancing eyes, wired bendable legs for posing. Came wearing a full red leotard with a big white collar, red shoes, came in a red and clear phone booth box. Marked on head: Ideal Toy Corp. T-12-E Marked on back: © 1965 Ideal T-12. 1965 Pos'n Tammy doll 12"
1965 Ideal Tammy Grown Up black doll, 11 3/4" tall, the rare Black Tammy version, short black rooted hair, brown side glancing painted eyes, slimmer Tammy body. 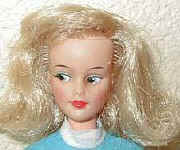 Black Tammy is marked on head: © 1964 Ideal Toy Corp. T8 12-W-2 and on body Made in Japan. 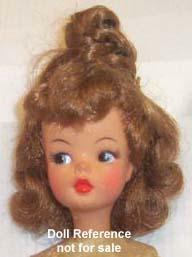 1965 Ideal Tammy Grown Up doll, 11 3/4" tall, short blonde or brunette pageboy hairdo with bangs, turquoise side glancing eyes, red lips, has the slimmer Tammy body, bendable legs. Marked on head: 1965 IDEAL Toy Corp M 12-3. 1965 Tammy Grown Up doll, 11 3/4"
1963 Ideal Tammy's Dad doll, 12 1/2" tall, molded hair, painted facial features, only came with straight legs. Marked on head: © Ideal Toy Corp. M-13 2 & on back: © Ideal Toy Corp. B-12 1/2 2. 1963 Dad doll, 12 1/2"
1963 Mom doll, 12 1/2"
1963-1965 Ideal Pepper doll, 8" tall, Tammy's little sister, came with straight legs or as a pos'n doll that has bendable legs. She has a rooted bubble cut hair style that came in several different colors, one of which is a carrot color, and has freckles, black side glancing eyes, pale pink lips. 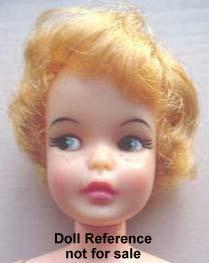 1964 Ideal Pos'n Pepper doll is marked on head: © Ideal Toy Corp. G9-E and on body: © Ideal Toy Corp. G-9-W-1. 1965 Ideal Pepper doll is marked on head: © 1965 Ideal Toy Corp. P9-3 and on body: © 1964 Ideal Toy Corp. 2DO-9. Depending on the year she was sold, she would have had a different outfit on. 1964 Posn' Pepper doll, 8"
1964 Ideal Dodi doll, 9" tall, Pepper's friend, came in both a straight leg or bendy leg Pos'n version. Marked on head: © 1964 Ideal Toy Corp. DO-9-E on back: 1964 © Ideal 1 DO-9. 1964 Ideal Patti doll, 9" tall, Pepper's friend, Montgomery Ward Department store exclusive, most of the Patti's have long straight brunette hair but a few have been found with rare blonde hair. Marked on head: © Ideal Toy Corp. G9-L on back: © Ideal Toy Corp. G-9-W 2. 1964 Ideal Pos'n Pete doll, 8" tall, Tammy's little brother, the pos'n dolls all have the bendy legs, same doll as Pos'n Salty but dressed differently. Pete came dressed in a solid color knit tee shirt with jeans that have a patch on each leg and tennis shoes. Salty has a striped knit tee shirt. 1964 Posn' Pete doll, 8"
1964 Ideal Pos'n Salty doll, 8" tall, Pepper's friend, same doll as Pos'n Pete but dressed differently, he wears a striped knot shirt, rust pants, tennis shoes and had a vinyl baseball type cap. Marked on head: © 1964 Ideal Toy Corp and on back: © 1964 Ideal Toy Corp P8. 1964 Pos'n Salty doll, 8"
1964 Ideal Ted doll, 12 1/2" tall, Tammy's big brother, molded hair, painted facial features, non bendable legs, came dressed in a red, white and blue knit tee shirt with blue shorts and white tennis shoes. 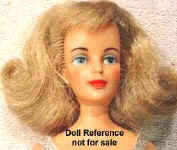 Marked on head: back: © Ideal Toy Corp. B-12 1/2-H 2 or W-2 and on back: © Ideal Toy Corp. B-12 1/2. 1964 Ted doll, 12 1/2"
1965 Ideal Bud doll, 12 1/2" tall, Tammy's boyfriend, he has molded hair, blue painted eyes, non bending legs, (has a smaller head than Ted), came dressed in a knit red, white and blue striped tee shirt with blue shorts and white tennis shoes. 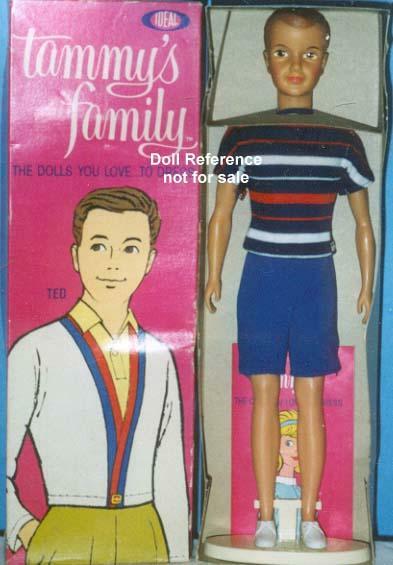 Bud is the most difficult of the Tammy family of dolls to find. Tammy's big brother Ted is often confused with boyfriend Bud as they look similar, until side by side for comparison, also they both came in the same striped shirt, blue shorts and shoes. Marked on head: © Ideal Toy Corp. T8 12 W-2 on body: © Ideal Toy Corp. B-12 1/2/2. 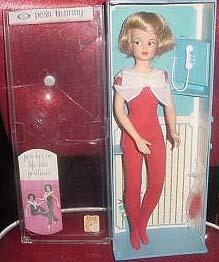 1965 Bud doll 12 1//2"
1965 Ideal Pos'n Glamour Misty doll, 11 1/2" tall, various rooted hair colors with a flip hair style with bangs, red lips, pos'n wired body, came dressed in a silver lame' jumpsuit with red sash. Marked on head: © 1965 Ideal Toy Corp. W-12-3 or © 1965 Ideal Toy Corp M12. 1965 Pos'n Glamour Misty doll, 11 1/2"
The Miss Clairol doll, 12"
1965-1966 Ideal Samantha doll, 12" tall, 9829-3 (marked on head: Ideal Doll M-12-E-2) has side glancing olive or light tan eyes (there are also a few rare centered eyes, doll has same markings), blond hair in a flip and no bangs, red lips, from the TV Show Bewitched played by Elizabeth Montgomery. Part of the Tammy Family of dolls. 1966 Ideal Misty doll, 12" tall, "center eyed", was the only Misty to have blue eyes that look straight ahead, Samantha head mold, long rooted hair in flip with bangs, red lips, made only a short time in 1966, and thus is the hardest to find and most expensive of the Misty' dolls, she wore a silver lame` and red jumpsuit. 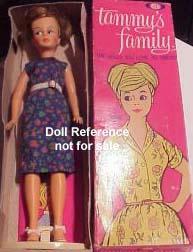 Part of the Tammy Family of dolls, marked on head: 1965 Ideal Doll M-12-E-2 same as the Samantha dolls. Marked on hip: ©1965 Ideal M-12 in an oval shape. 1967 Comic Heroines (4 dolls in this series) - Super Queens; Ideal Bat Girl doll, 11 1/2" tall, used the Misty face mold with side glancing eyes, brunette or blonde (Sears exclusive) rooted hair with no bangs, pink lips, Pos'n body style, wore a black tight fitting jumpsuit with bat logo on front, silver tone hip belt with cut out bat logo, blue cape, face mask, gloves & boots. The male series dolls were called "Captain Action" action figures, of which there were many in the series. 1967 Bat Girl doll, 11 1/2"
1967 Mera doll, 11 1/2"
1967 Comic Heroines - Super Queens; Ideal Super Girl doll, 11 1/2" tall, used the Misty face mold with side glancing eyes, blonde rooted hair with no bangs, pink lips, Pos'n body style, wore a blue short dress cape & red boots came with her white plastic super dog Krypto with red cape with a big gold S. Marked on head: 1965 Ideal M 12. Clothing tag has Comic Heroines 1966. 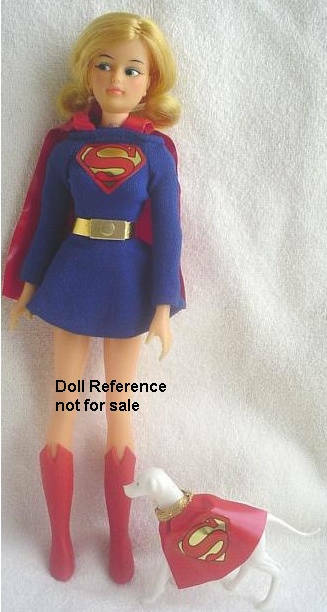 1966 Super Girl doll, 11 1/2"
1967 Comic Heroines - Super Queens; Ideal Wonder Woman doll, 11 1/2" tall, used the Misty face mold with side glancing eyes, brown rooted hair with no bangs, pink lips, Pos'n body style, wore a red, white & blue sun suit with gold emblem, gold head band, red plastic arm bands & red gladiator style lace up shoes, and a red, white & blue shield. Marked on head: 1965 Ideal M 12. Clothing tag has Comic Heroines 1967. 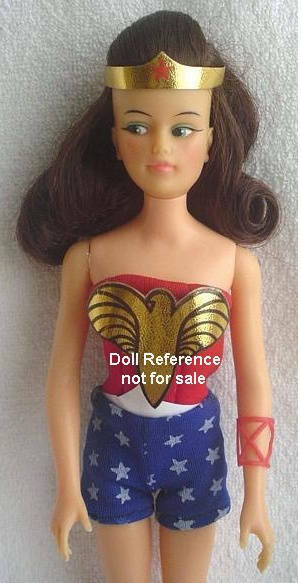 1967 Wonder Woman doll, 11 1/2"